I think I see two copies of Dragons Don't Share in Lady Sabelle's painting queue there. That's twice as many as I have not painted. Liking your ingenuity Mobius never did get enough KS3 battlements/crenellations myself thought I'd wait til KS4 lol. Having bought and built a lot of lego over the last 10 years I can see your point LadySabelle but I see it as being about aesthetics over modularity, without the custom pieces all Lego kits would look like a minecraft build, now whilst some may prefer that aesthetic, and lets be fair those builds can still be done, the custom pieces do add to the overall look and in my opinion gives you more pieces to create even more elaborate custom builds as my daughter constantly shows me. Looking forward to seeing your 'Dragon' castle build next year or whenever its completed, will take a month just to build! I think you will be able to attach walls to towers at different angles relatively easily if they are not 'fully' inserted and integrated (or even just butted), the issue is then total wall coverage of battlements/crenellations, that may require some thought or judicial modding. Geekjeff, thanks for sharing. I've responded to your email. 2017 is just tooooooo far away. I'm hoping that by next week my hedge maze molds will be ready for sale and then I can start painting CBS! (And casting like mad, as the July firework deadline is far too close for comfort) I'll get some pictures once I have some ready to set up. Mobius, that's a very resourceful build. In a lot of ways I think that builds like this are more impressive than having all the custom pieces. That's what I've felt about LEGO for years and now they make a ton of custom pieces and it feels like cheating. You're build uses what you've already got and in a creative way. I applaud all the DF fans with the imagination to make do with everything they've got. Yes, it's the original castle from Dragon Magazine. My husband put it together when it first came out (back in June 1984 so it's 32 years old.) He left it with his mom when he joined the military and it survived at least a dozen moves. About 8 years ago, when his mom was moving again, we got it from her and brought it home. It has a protective case now and resides in our game room. Ooh, that's a neat design and will be frickin huge! Can't wait to see it. I sent you an email with some angled wall ideas you might want to check out. Might be relevant to your build. The keep would be a 2-storey high 12x4 Stone building with KS3 straight and corner crenellations on top. The round areas are the small round crenellations from KS4 on round dungeon walls, with a basic dungeon tile (on pillars or a spacer block) on the inside. This "shoe-string" castle will look sad compared to the amazing $2-5K castles that I look forward to seeing everyone post, but I believe that it will still look very impressive to my non-DF gaming friends. Would it be easier to have Long Walls, Corner Walls, and requisite Cutout Corner Walls and Tower Transition sets for towers? Absolutely. But I'd rather spend those dollars on versatile pieces like Cube Spacers and Stone Bridges. Seriously, I'd buy two more sets of each if I could and forego staircases for castles and dungeons, just for ease of mini placement. (Paraphrasing the RedHot Sauce Guy, I'll put that sh*t everywhere.) And Ruin sets are the perfect setup for entry-level dungeons, (B1 - In Search of Adventure, anyone?) especially when you can assemble/repurpose them as regular walls. 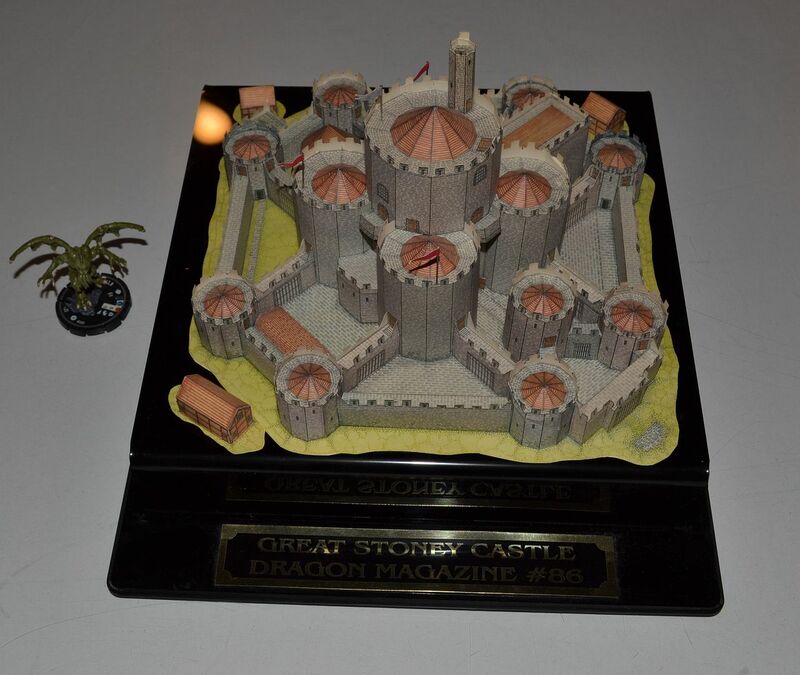 I'm trying to make the Great Stoney Castle from Dragon Magazine #86. I just have to sculpt some wall adapters so that the straight walls can attach to a tower at any angle.